CSRHub CEO Bahar Gidwani has authored a new Director Notes for The Conference Board. 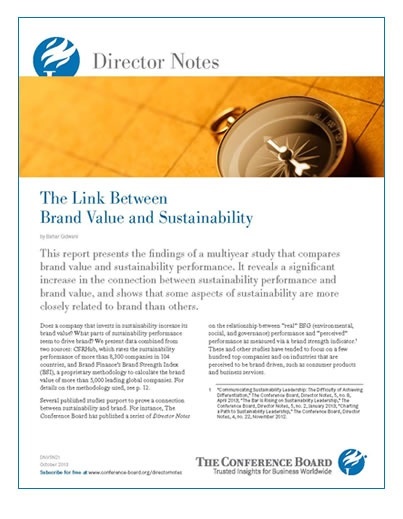 The Conference Board has now published a new Director Notes on CSRHub’s recent brand study, The Link Between Brand Value and Sustainability. Bahar authored the study working with Brand Finance, the global brand analyst headquartered in London. This study proves there is a strong link between Brand Strength and Sustainability, with the correlation doubling in 2012 to 28%! You may have seen this study in Bahar’s 5-part blog series on CSRHub or other outlets. Now, you may download this beautifully published study all in one PDF document, including all the support charts and graphs. Which Sustainability Factors Are Most Linked to Brand Strength? 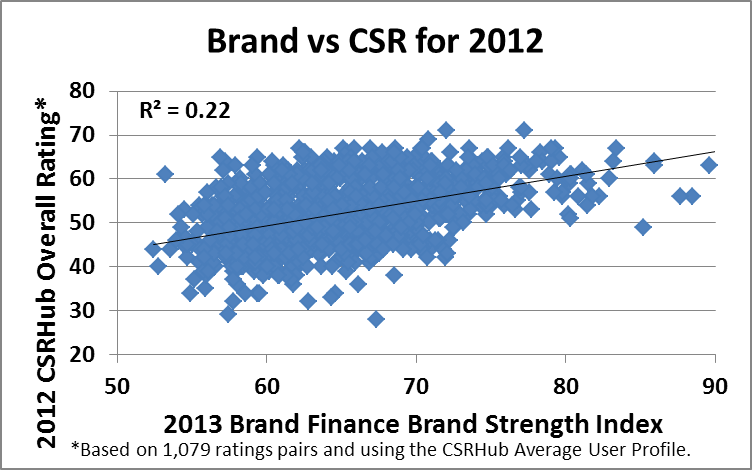 In the previous posts in this series, we have described the relationship between Brand Finance’s Brand Strength Index and CSRHub’s sustainability rating. The overall correlation between these large sets of data is strong—and it has been growing stronger. We will now look at how each of the twelve individual components in CSRHub’s metric system relate to brand strength. CSRHub ingests sustainability information from 230 sources that each have their own way of measuring and rating corporate social performance. In order to make sense of these different measures (we have more than 9,000 different indicators in our system), CSRHub has mapped each indicator from each source into one of twelve “subcategories.” (You can see a description of this schema here.) These subcategories are then grouped into four categories (with three subcategories in each category). The ratings for each subcategory are forced into a curve that has a central tendency (around 50 on a scale from 0 = low to 100 = high). There is a natural tendency for subcategory scores to be correlated (i.e., a company who is good on one measure of sustainability tends to be better on all of the others), the correlation between subcategories is generally between 0.25 and 0.5 for subcategories that are in the same category (e.g., Energy & Climate Change vs Resource Management) and between 0.1 and 0.25 for subcategories that are in different categories (e.g., Product and Board). To understand which subcategories may be more important for brand strength, we performed a multivariate analysis between the twelve CSRHub subcategory scores and the Brand Finance Brand Strength Index. 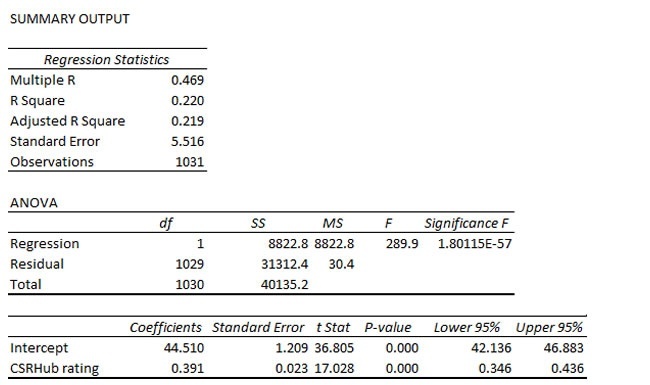 The results of the regression mentioned show that eleven of the twelve CSRHub’s subcategories have meaningful individual correlation statistics. Only our Human Rights & Supply Chain measure seems to have no correlation with brand value. We performed a similar analysis on our 2011 data set—using 921 sets of data. 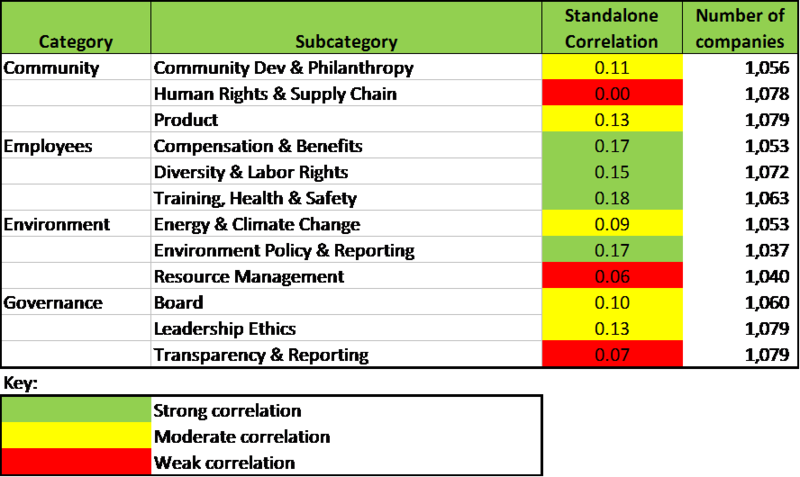 Both the coefficients for the multivariate regression and the relative strengths of the correlations between each subcategory and brand strength were similar. The extent of correlation was less at all levels for the 2011 data. We would expect that product sustainability, leadership ethics, and a company’s environment policy and reporting would be tied to brand strength. These are areas that companies actively invest in and communicate about. The weaker ties to board performance, transparency and reporting, energy and climate change, and resource management may be due to the fact that consumers have few means to connect these areas with the products they buy. The most surprising results are the weak relationship between brand and human rights and supply chain issues, the modest effect of community development and philanthropy, and that how companies treat their employees is important to their brand strength. Human rights and supply chain. Our rating in this area goes up when a company is more transparent about its behavior. It also goes up when a company has few “incidents” with its supply chain and when it takes steps to enforce socially positive policies (such as diversity, fair pay, and workplace safety) on its suppliers. We suspect that consumers may not understand the complexity of the issues companies face in this area. They may distrust company communications in this area or dismiss them as “window dressing.” More communication and transparency may indicate that a company has problems in the area, without making it clear that the company has solved some or all of them. Community development and philanthropy. Many companies assume their investments in these areas will support their brands. However, it is hard for a company to brag about its good deeds without appearing to be “paying for love.” Further, an investment in one community may not pay off with brand benefits in other/all communities. Employee treatment. Many studies have shown that consumer brand impressions are heavily influence by the behavior of a company’s employees. Polite, knowledgeable service people; employees who actively serve in community organizations; and personal contact between employees and customers can directly affect how a brand is perceived. If corporate social responsibility performance drives brand strength, companies have yet another reason to care about their social performance. We do not advocate cutting expenditures on human rights and supply chain improvements. We believe that consumer awareness in this area will grow rapidly—spurred partly by news coverage of events such as the recent collapse of a factory in Bangladesh. However, we hope that our results show companies that investing in better treatment of their employees may also increase the strength of their brands. Our results also suggest that brand managers may expect to see broad benefits on their brand strength from promoting and leveraging their company’s good social responsibility performance. We plan to repeat our study using Brand Finance’s next annual BSI data set (due to be released in March 2014). We are also reaching out to other groups who have brand data and digging into the indicators and data we have from our 230 other data sources. We intend to study the performance of “outliers”—companies whose brand and sustainability performance run counter to the general trend we have described. We invite any company or group who is interested in this area to contact us regarding this work. We will need detailed information and input from the management of both brand-driven and non-brand driven companies, if we want to understand best practice in this area. Part 3 Is the Correlation between Brand Strength and Sustainability Due to Random Chance? Part 4 of our 5-part series. In the last post in this series, we examined our finding that brand strength and sustainability are correlated. We found evidence that the relationship we have discovered between Brand Finance’s Brand Strength Index and CSRHub’s corporate social responsibility and sustainability ratings are not due to random chance. Let’s assume the relationship is real. How has it changed over time? 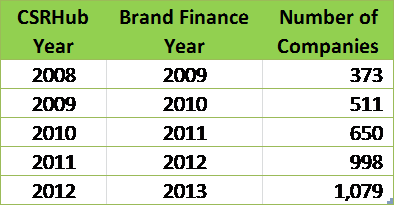 Both Brand Finance and CSRHub have used consistent methods to evaluate companies over the past five years, from 2008 through 2012. Because we wanted to see how the brand-sustainability relationship changed for each year, we included all of the available company pairs for 2012 and then for each year, used only the companies that were also present in the following year. While the number of companies studied in the earlier years is less than that in the latest data set, all years include more than 350 company data set comparisons. The correlation between the BSI and CSRHub’s overall rating averaged about 0.11 for the first four years of our study (2008 through 2011). The jump to 0.22 in 2012 is quite dramatic. The 12 factor analysis for 2011 gives a 0.19 correlation. This is again lower than the 0.28 correlation we get for the twelve factor analysis in 2012. This confirms that there has been a strong improvement in the relationship we are studying. The growth of informational web sites such as TriplePundit, Greenbiz, JustMeans, 3BL Media, SustainableBrands, EnvironmentalLeader, 2DegreesNetwork, and of course, CSRHub. We would expect this correlation to continue to grow, although there should be a natural limit on how much of brand strength can be driven by social performance factors. We look forward to repeating our study in 2014, when we have a new year of data from our partners at Brand Finance. Our next and last step will be to see which parts of sustainability seem most closely related to brand strength. Is The Correlation Between Brand Strength and Sustainability Due to Random Chance? 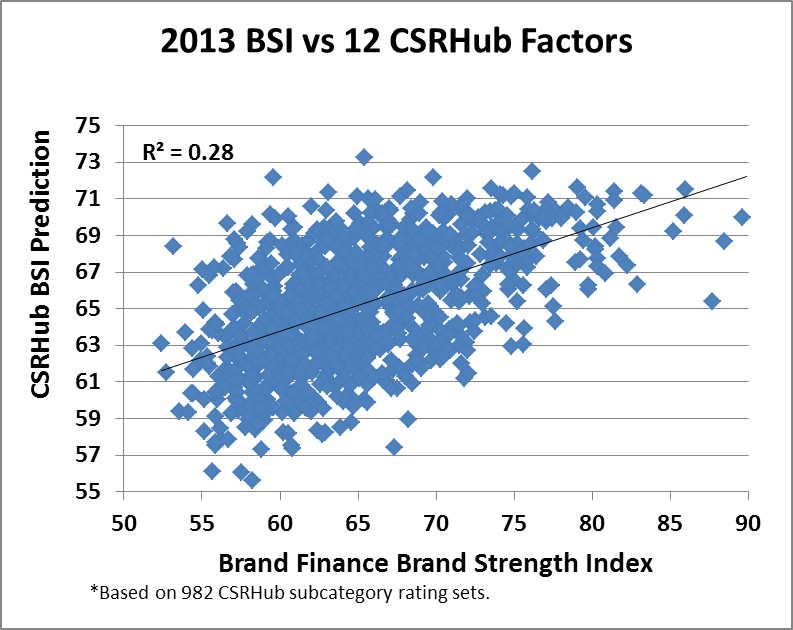 In the previous posts in this series, we showed that there is a strong correlation between brand strength as measured by the Brand Finance Brand Strength Index and sustainability as measured by CSRHub’s metrics engine. We promised to examine more closely whether or not the correlation we discovered is meaningful. There are several ways to test the strength of the correlation between two sets of data. The easiest is to estimate the probability that an observed correlation is actually zero (no correlation). This probability is expressed via an “F” value. An F value equal to one would indicate that the chance that the observed correlation is zero is the same as the chance that it is non-zero. Given the ~1,000 data points we have, an F value above 4 would indicate only a 5% chance that the observed correlation is zero. The “F” value for our simple brand value versus CSR correlation is 289.9—for our correlation of all CSR factors against brand value the F value is 31.8. Both results suggest a vanishingly small chance that there is no correlation between the data sets. Another test is to see if splitting a data set randomly into two groups causes any change in the observed correlation. This simple test often reveals that a correlation comes from the combined effect of a few outliers or some other artifact of the data. We used a random number generator to divide our scores in half. Of course, splitting the data set reduces the total number of data elements in each sample. However, over several trials, our correlation coefficient remained between 0.21 and 0.23. Could we be seeing only a spurious relationship between our data sets that is caused by them both being correlated with a third factor? It is impossible to rule out this type of problem—there are too many possible third factors to consider. However, we can at least test a couple reasonable alternate explanations. For instance, could both brand strength and sustainability be positively correlated with enterprise value? We have tested this idea and see that while there is a fairly strong correlation between BSI and enterprise value, there is only a weak correlation for CSRHub’s ratings. 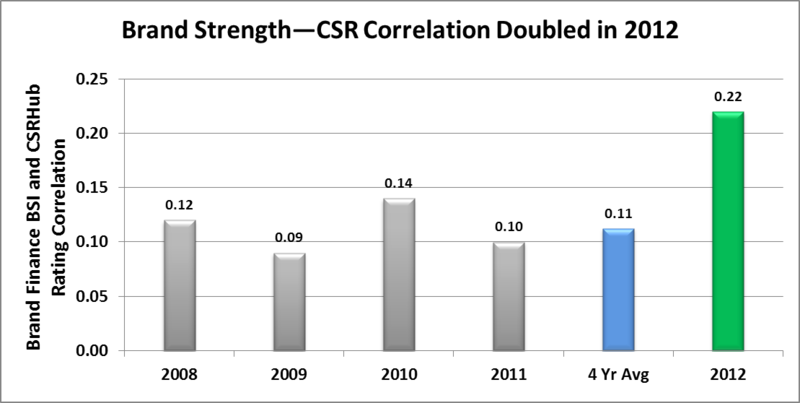 If we include enterprise value in our regression, the correlation coefficient between enterprise value plus CSRHub score and the Brand Strength Index rises to 0.39. 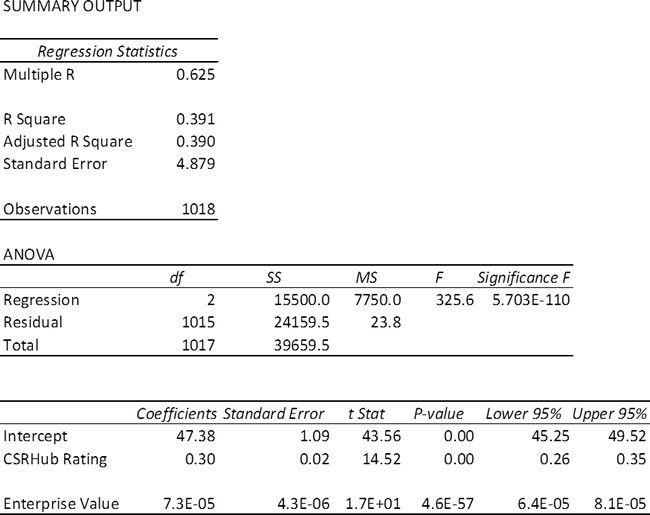 The T statistics for both the CSRHub rating and enterprise value dependent variables are highly significant--well above the 3.3 needed to support a 99.9% confidence that these correlations are non-zero. From this, we can conclude that enterprise value could explain a portion of the relationship between brand strength and sustainability, but not all of it. Could the correlation we have discovered exist only for companies in “branded” industries and not true for other areas? We split our sample and examined the correlation for each type of company. As you can see, there appears to be relatively little difference in the correlation by industry type. As we noted in our previous post, correlation is not a proof, but it can be a “hint.” We believe that we have shown strong evidence that brand and sustainability are connected. We will next look at how that relationship has changed over time. In a previous post, we laid the foundation for comparing a huge database on brand strength with the world’s largest database on corporate sustainability. Our analysis follows for a strong correlation between the Brand Finance Brand Strength Index (BSI) and CSRHub’s overall sustainability performance rating (using the profile of the average CSRHub user). The chart below shows this correlation for 1,079 companies. It appears that about 22% of the variation in BSI can be explained by changes in perceived CSR performance. CSRHub’s rating relies on four category ratings that in turn are based on twelve subcategory ratings. When we perform a multivariate regression between the BSI and the twelve CSRHub subcategories, we get an even stronger correlation of 28%. One measure does not affect the other. They just appear to due to random variation. 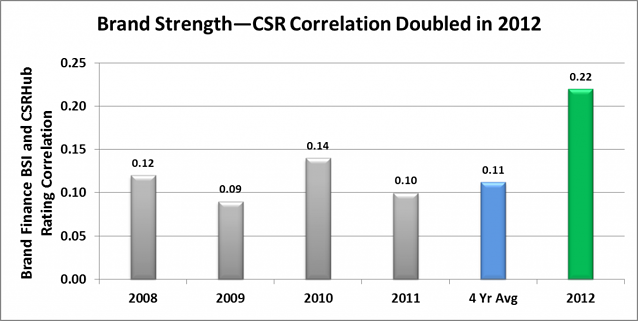 Brand value and CSR performance could both be correlated with some other factor such as market capitalization. As a result, they appear to be correlated with each other, but in fact just share a common driver. Brand value and sustainability are related and a company that seeks to do well in one area should consider also investing in the other. As Edward Tufte has put it, "Correlation is not causation but it sure is a hint." Our next post will probe to determine which of these explanations is most likely to be true.